This gun toting Law-BOT is ready to enforce some law in Wappelville. He's glowing with RJ-1027 energy. And he takes NO PRISONERS. Time to go clear out some Outlaws!!! 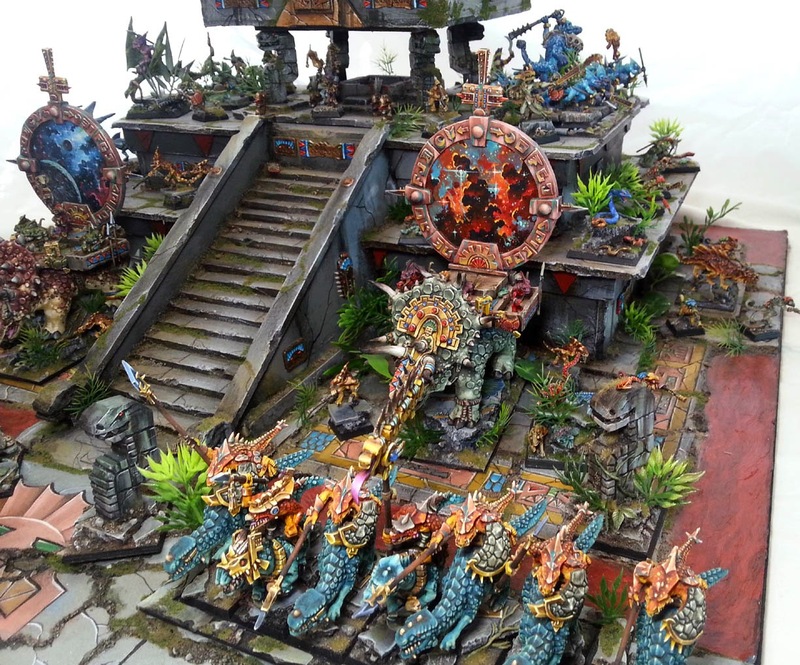 After the massive reshoot of the Tomb Kings army using the new LED Daylight bulbs, the next army I wanted to try out was the Lizardmen, the very first Warhammer Fantasy army I ever painted. 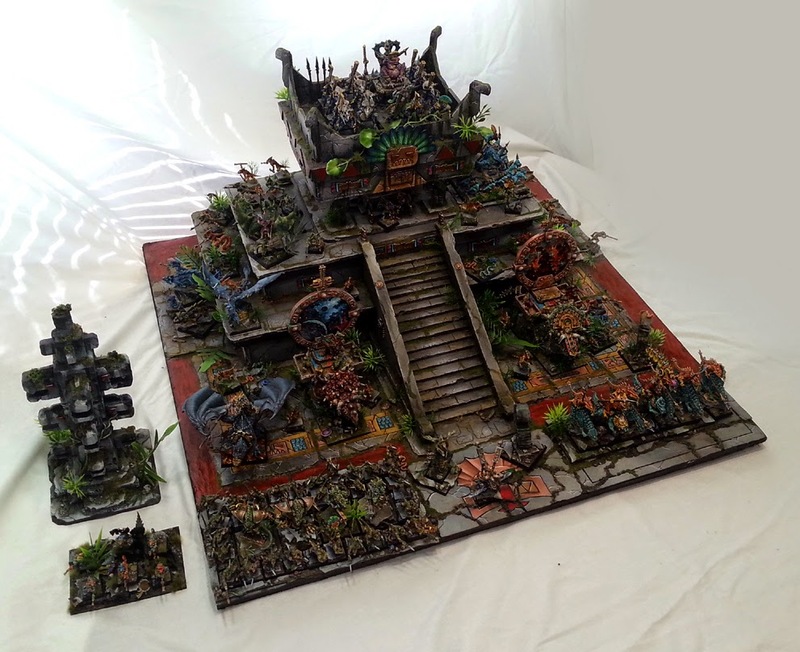 I created this army display board for Adepticon years ago, and it still stands strong today! Welcome to the Temple of Blood. 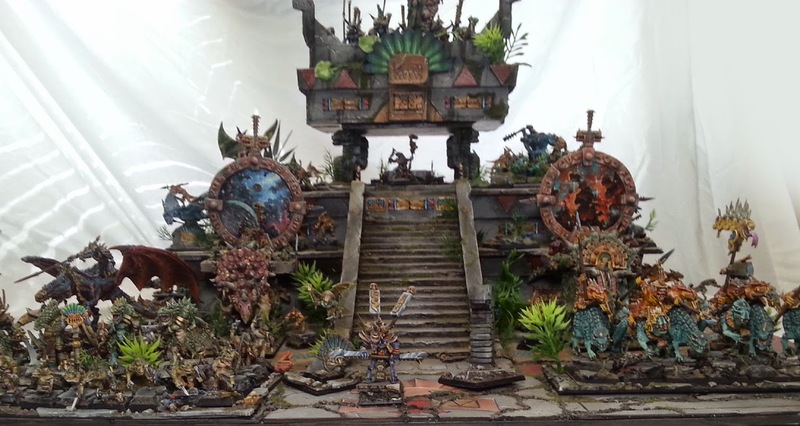 The army won numerous best painted and Player's Choice awards at Adepticon and elsewhere. 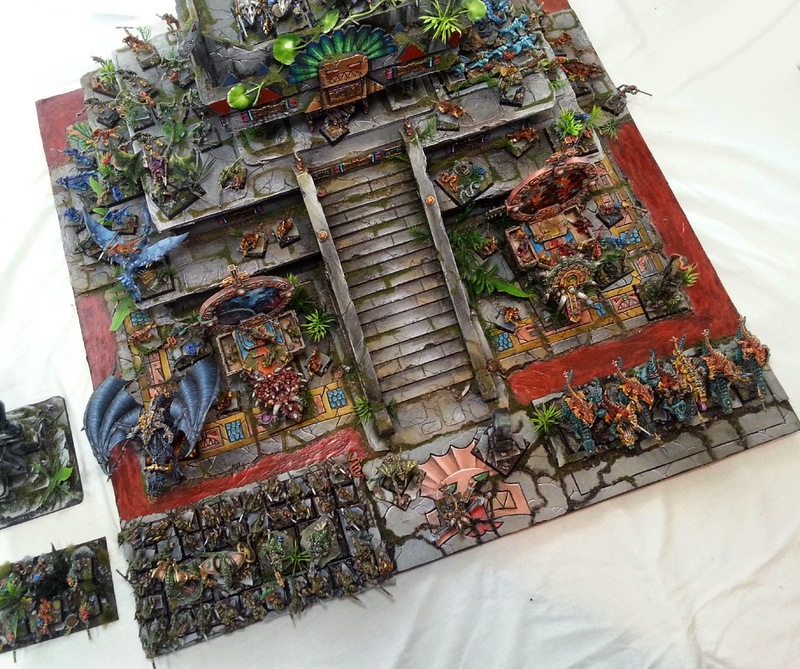 As I have mentioned in other posts, it was also a gaming piece, and we played a number of battles on it. 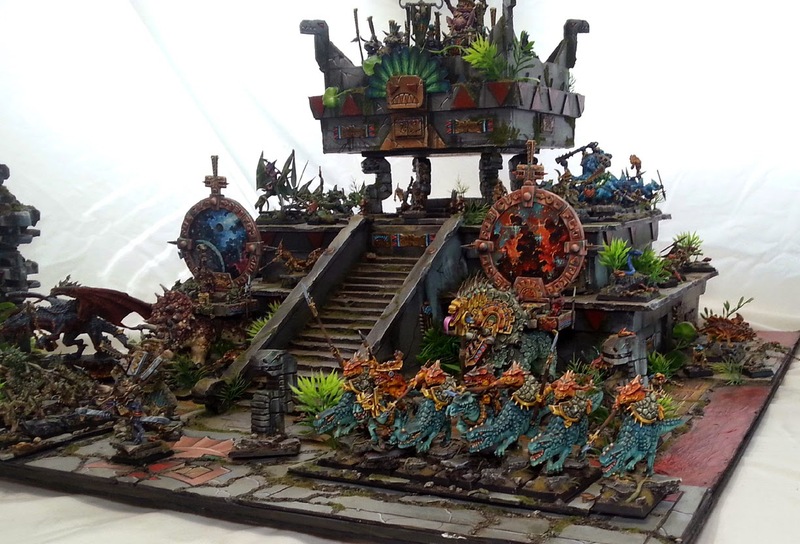 The crowning achievement for this work was winning the first North American Armies on Parade. 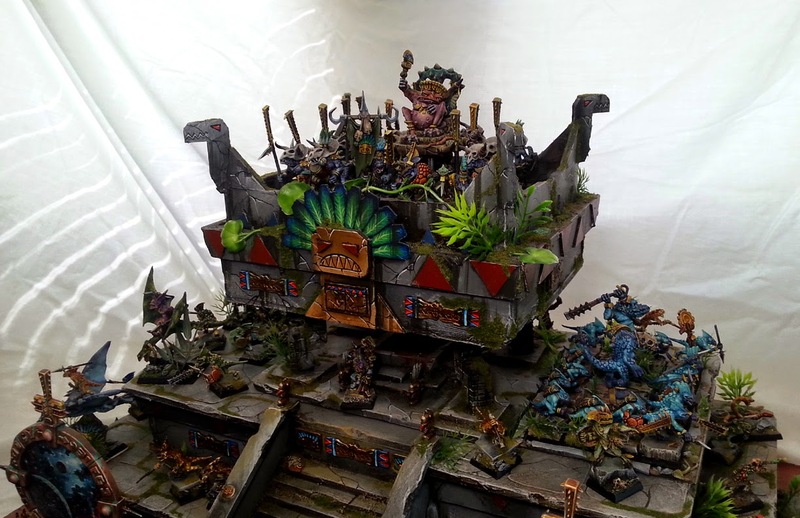 I had to construct the Temple to make sure that it would fit in the angled display cases that they were using at the time, which was no small feat of engineering! I wanted the board to look like a Temple, but it also had to be functional. 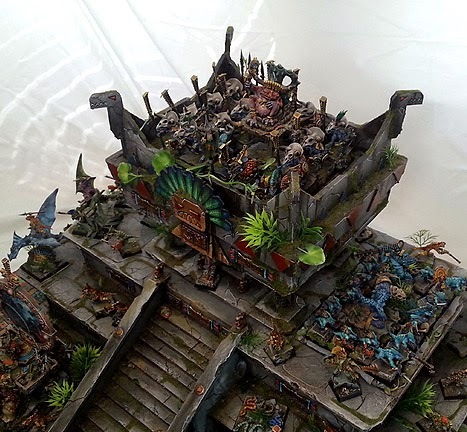 Some of the upper levels had to be changed quite a bit to accommodate movement trays and so on. 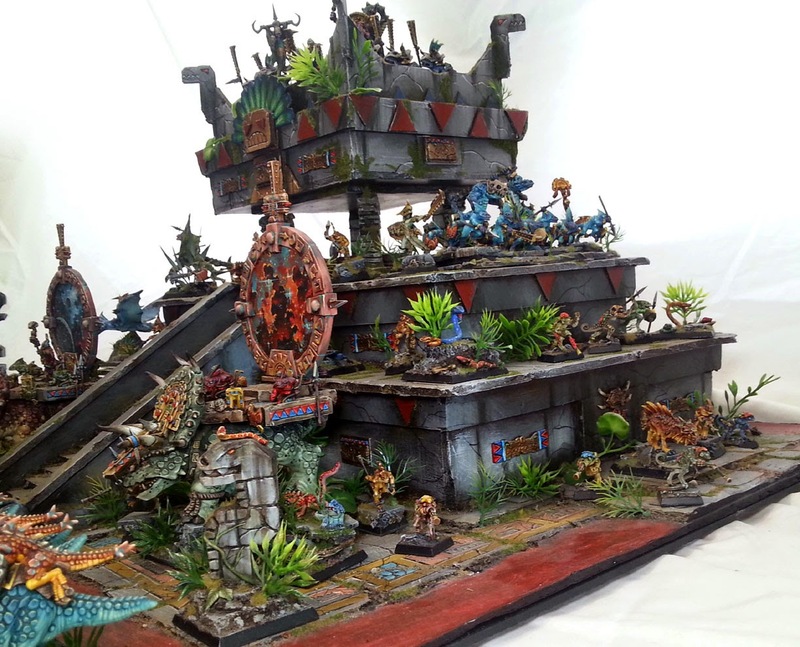 The two Engines of the Gods that you see on this board are just a few of the scratch built miniatures that are scattered across the Temple. Terradons and other creatures also had to be built from scratch , or heavily converted. I will be creating a gallery of the finished miniatures on the Windy City Miniatures facebook page after Adepticon. 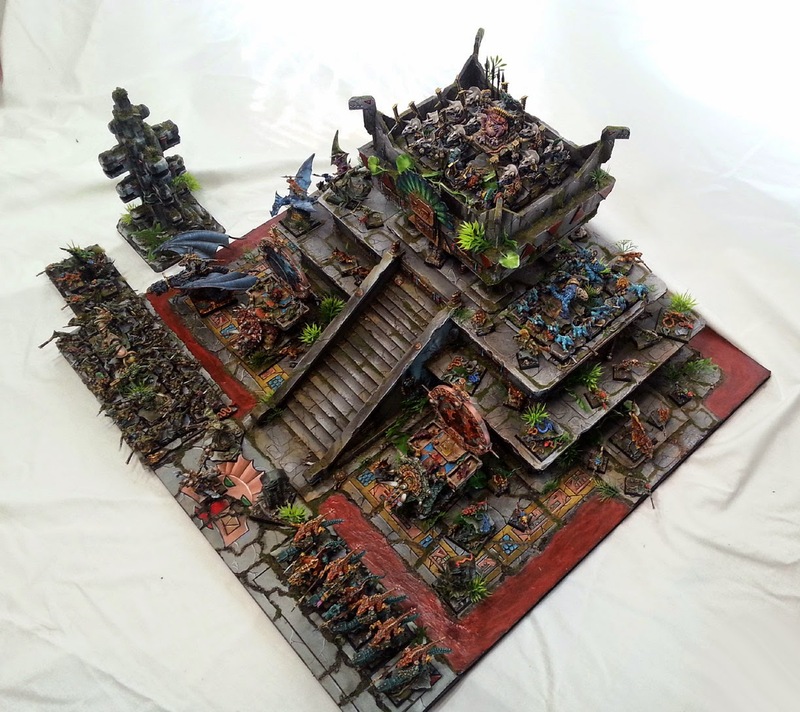 This first massive army project was inspired by what I saw in the Adepticon tournament rooms our first few years at the convention. 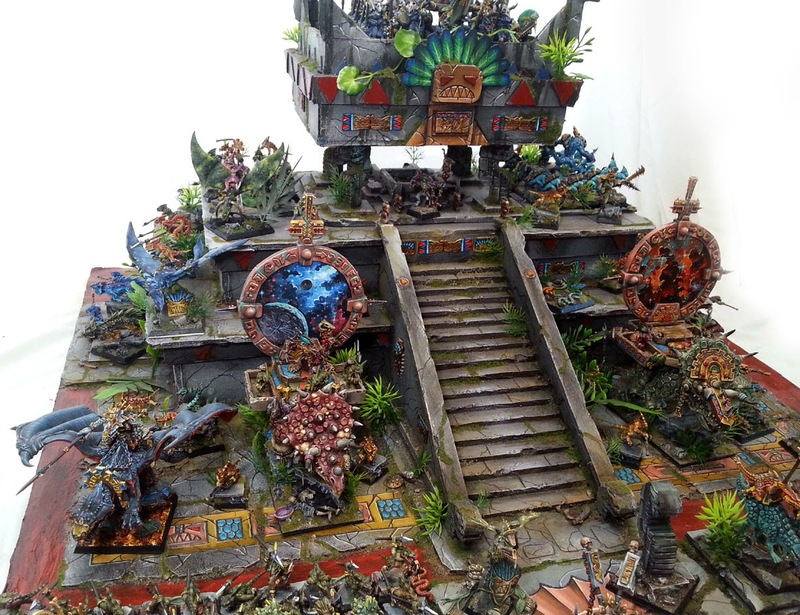 I saw a room full of very well painted armies and ingenious display boards. I felt that I must do the same! There will be more posts coming that show closer in views of the Temple and its residents. 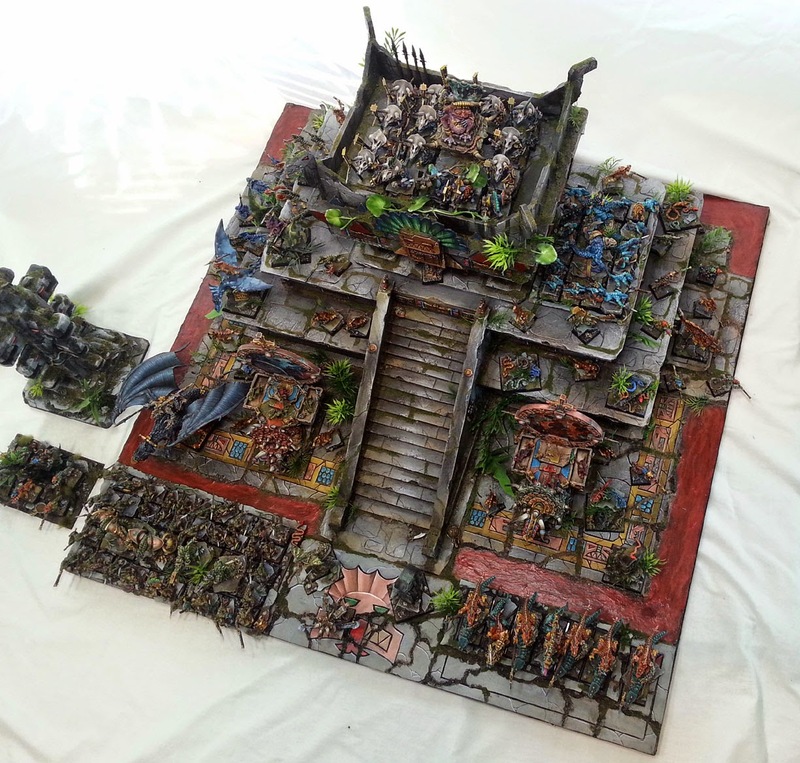 I will also have some links to battle reports that took place on this terrain piece turned display board. Of course, Mage Priest Babo leads the way, his contemplations divining knowledge of all things. This was the army that started it all... 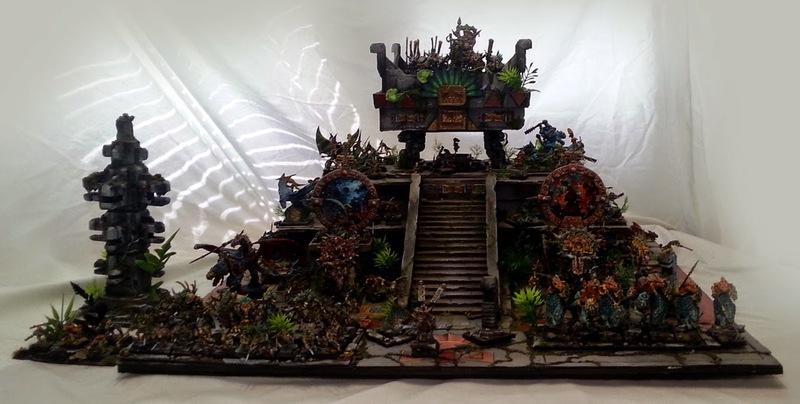 I have done two 40k armies in this style of display board/terrain piece, as well as a second Fantasy army, and even my Lord of the Rings armies. 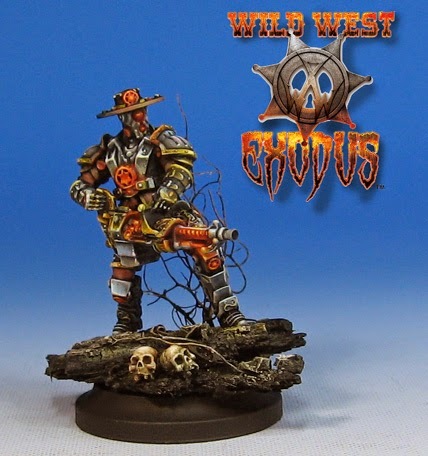 Now Wild West Exodus posses join in on the fun! There's nothing quite like painting armies!!! Stay tuned for much more, and be sure to check out some of the original Lizardman blog posts, as they were the first I ever made!! !